In 2014, Russia's share in world military spending reached 4.8 percent, which puts it in third place in the world after the U.S. and China. However, Russia is ahead of the world's major powers in terms of the share of GDP allocated to defense, which, according to experts, is already putting the country at risk of falling into an arms race, just as the Soviet Union did. Russia's share in world military spending reached 4.8 percent in 2014, placing it third in the world after the U.S. and China, whose shares were 34 and 12 percent, respectively. This conclusion was the result of a report published by the Stockholm International Peace Research Institute (SIPRI), the Russian news agency TASS reported. According to the document, Russian military spending in 2014 increased compared to the previous year by 8.1 percent to $84.5 billion, or 4.5 percent of GDP. According to Vasily Zatsepin, a senior researcher with the Laboratory of Industrial Market and Infrastructure Studies at the Russian Presidential Academy of National Economy and Public Administration, Russia's third place by its share in world military expenditures does not correspond to its place in the global economy (it was eighth in nominal GDP with a share of 3.4 percent in 2013; data for 2014 is not yet available). Zatsepin said this is evidence of the increased and totally excessive militarization of the Russian economy. "In the economic situation Russia is in at the moment, nothing can justify such high military spending," he added. Misbalance in Russia’s state budget? According to experts, the burden on the budget is more frequently defined not by the country's share in the global arms market, but by the ratio of military spending to GDP. By this indicator, Russia is also one of the leaders in the world. According to Zatsepin, the world average military burden on the economy in 2014 was 2.4 percent of GDP, which is the relative amount countries allocate to military spending on average. For example, according to NATO requirements, alliance member countries are obliged to allocate at least 2 percent of GDP to defense, though only four members of NATO usually follow this rule, one of which is the United States. The U.S. spent $610 billion on defense in 2014, or 3.5 percent of GDP, while China spent $216 billion, or 2.2 percent of GDP. 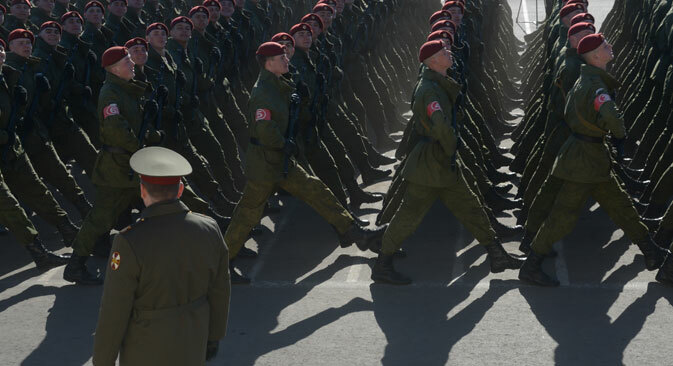 While SIPRI’s estimate of military spending in Russia is 4.5 percent of GDP, according to official figures it is 4.8 percent, which is twice the world average, says Zatsepin. Furthermore, in terms of the share of GDP spent on military purposes Russia is well ahead of the two largest world economies. However, according to Dmitry Baranov, a leading analyst at investment holding Finam Management, the share in the world military spending market is also used by experts to compare the militarization of the economies of different countries. According to him, this is an appropriate marker, and it can be used in comparison with equivalent markers in other countries. "Unfortunately, both of these markers suggest a substantial misbalance in Russia's state budget in favor of military expenditures," said Zatsepin. According to Zatsepin, the militarization of the budget has resulted in Russia crossing the threshold generally seen as marking a country’s entry into an arms race – about 4-5 percent of GDP. It was participation in an arms race that ultimately resulted, among other things, in the collapse of the Soviet economy at the time. According to the calculations of Yegor Gaidar, former head of the Russian government and the author of the market reforms of the early 1990s, expressed in his book Collapse of an Empire, the USSR produced more tanks than it could use in any military conflict. However, the drop in oil prices has forced the Russian authorities to cut military spending: In 2015, it should see a 5-percent reduction. On the whole, according to the report, the United States and Western Europe decreased military spending in 2014, but this reduction was offset by growth in Eastern Europe, Asia, Oceania, Africa and the Middle East. According to the head of the SIPRI's military expenditure department, Sam Perlo-Freeman, "in many cases, ‘growth of military spending’ is the result of corruption, personal interests and autocratic rule."